An animal spiritual projection of a man in The Other Realm, "Sleeping Boar" has come to Void City on a ritualistic coming of age mission. Spiritual animal guides are a pleasant mix of Animal and Human, and "Sleeping Boar" is no exception. He is highly intelligent, and this is reflected in his spirit animal. He has the ability to speak vocally and in thought (for those who do not hear, and therefore cannot comprehend, common language). He does not speak with much majesty or grace--he has the tendency to be uncouth, and quite vulgar. 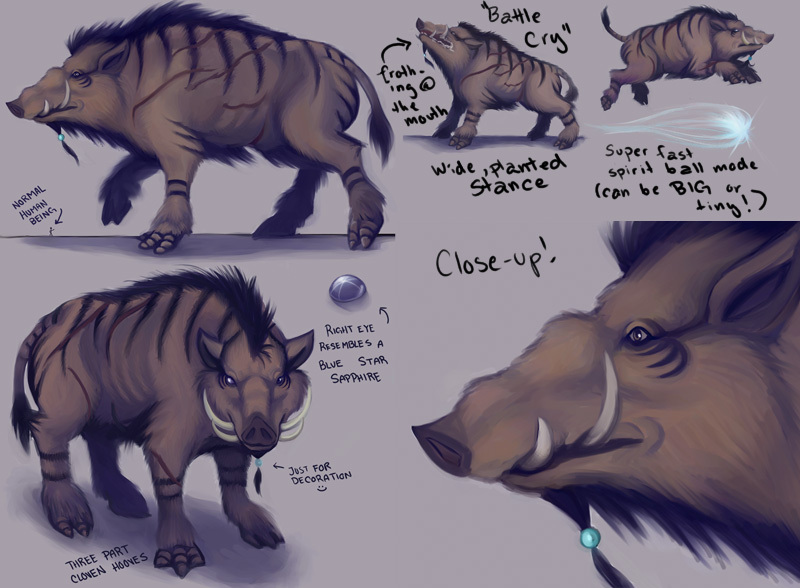 He also has poor eyesight, which is likewise characteristic of boars, and relies on his sense of smell and hearing, as well as extrasensory capabilities he developed during his stay, and training, with The Tribe. He has the ability to roam as a spirit--not disturbing his surroundings. It's actually his preferred method of manifestation. He is unaffected by physical attacks in wandering spirit mode. Unless he fully enters the realm, then there will be a bit of difficult maneuvering for him to do, and he is vulnerable to attack. You can see him in his wandering spirit mode in the Introductory Story, as well as in the Win/Lose image. Height: ~210 ft, as stated above. **The average american male is 5.75 feet tall. "Sleeping Boar" is about as tall as 36 average-height males…just in case if anyone is curious about scaling. Weight: …Pretty heavy. As a wandering spirit, he is weightless. Brute force, lunging, and gouging with his tusks. "Apparition": can appear wherever, whenever. This coincides with his wandering spirit mode. "Battle Cry": The Last Resort , or Panic Button attack. When a boar is alarmed, or discontent, it will squeal. "Sleeping Boar" has a battle cry that can shake and destroy the foundations of immediate surroundings, shatter glass, rupture eardrums, cause temporary and/or permanent hearing loss, mild to severe disorientation, incapacitation, brain aneurysms, and death. 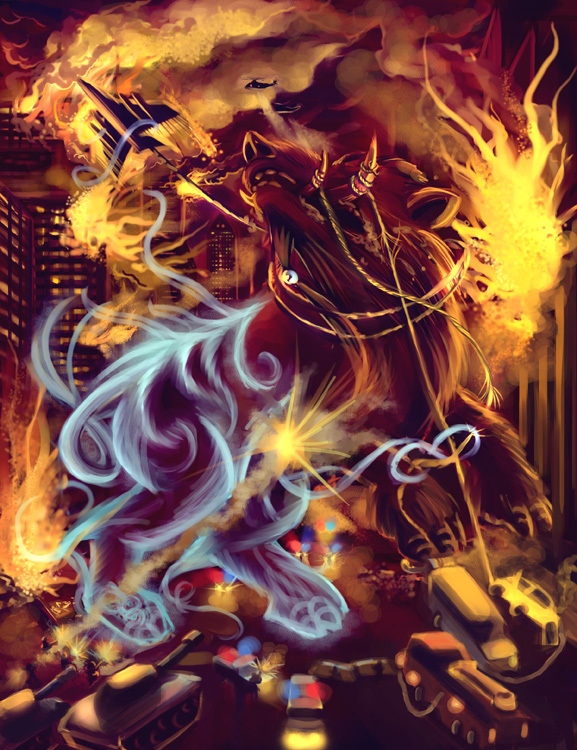 You can see in the rendering of "Battle Cry" that he is frothing at the mouth. This is a common behavioral aspect of boars; they raise their lips high over their whetters and start frothing at the mouth to serve as a sort of "no nonsense" intimidation. “Sleeping Boar” is a Protector: Characteristic to the boar, they are docile by nature...unless provoked by an outside agenda, or by taking the initiative to eliminate greater threats.